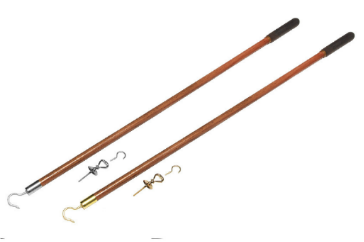 A solid oak reach hook allows the attic ladder to be pulled down and closed easily. The Dallas market is no stranger to great inventions, from frozen margaritas and ATMs to corny dogs and convenience stores. We have another homegrown success to call our own: Attic Ease. 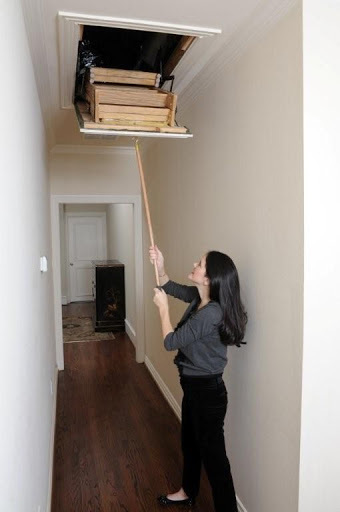 It’s a simple product designed to solve the problem of ugly dangling attic strings. This has filled a big need, because since the product was launched in February 2012, it has sold thousands of kits online and in stores around the country. Attic Ease was imagined and invented by Dallasite David Jones. He was challenged by his family in 2011 to come up with “something better” than the unattractive and obtrusive attic cords on recessed attic doors that exist in an estimated 80 million homes. That “something better” offers what Jones calls a simple, efficient, and fashionable solution to an unsightly problem, allowing homeowners to access and stage recessed residential attic stairways. 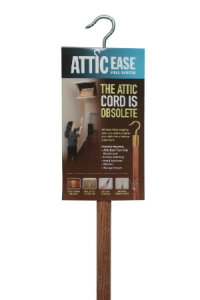 Each Attic Ease kit is a complete system that includes a fashion pull ring to replace the existing cord; a solid oak reach hook that allows the attic ladder to be pulled down and closed; and a fashion storage hook for storing the reach hook when not in use. We talk a lot about staging and how to make a home look its best, but there’s a proverbial elephant in rooms and hallways across America — that dang ugly attic cord. At the prodding of his family, David Jones set out to get rid of that unsightly cotton cord that plagues homeowners. What he came up with is the AtticEase, a stylish wooden and brass fixture that allows access to attics without the antics of jumping for the cord that dangles and collects dust. We wanted to know more about how Jones, an executive at Harvard Companies, developed the Attic Ease. He was kind enough to answer a few questions for CandysDirt.com. Enjoy! CandysDirt.com: People usually invent things to fulfill a need. When were you inspired to create the Attic Ease? David Jones: My wife, Kay, and I have always enjoyed our beautiful homes. Over the years, many of our homes contained what we affectionately called “ugly dangling attic cords” hanging from the recessed attic doors that were located in our hallways, closets, rooms and garages. We were always perplexed as to how these “cords” could be eliminated to enhance the beauty of our homes. My daughter, Jenny Wood, and her husband, Nathan, lived in a beautiful home in Highland Park that was plagued by a similar problem. In their second floor hallway sat the same old “ugly dangling attic cord.” But Nathan had devised a make shift system where he got an eye-bolt and replaced the cord and built a reach hook by screwing a hook into the end of a broom. The result was indeed better than a “dangling cord” but not by much. Jenny and Nathan challenged me to come up with “something better” if I didn’t like their home engineering project. I was determined to do it. I set out on my journey to create the perfect solution to an ugly problem — get rid of that ugly dangling attic cord and replace it with something that was fashionable, efficient, inexpensive and practical. CD: Tell us a little about your design process. Jones: “Trial and Error” best describes my efforts to design the perfect solution to the “ugly dangling attic cord” dilemma that exists in more than 80 million homes in the U.S. alone. After a long (back of the envelope) design process I contacted numerous manufacturers of all the component parts that I believed were necessary to create the perfect “kit.” I worked with wooden dowel manufacturers; decorative hardware distributors; mechanics, wood finishers; grip manufacturers; and hook and pull rings manufacturers from literally all around the world. A prototype that looked good, worked and could be manufactured and assembled at a cost that made the product reasonable and marketable was developed. I hired an intellectual property attorney, Stephen Walder, of Dallas who walked me through the process of securing a trademark and a patent. We were awarded both after more work, worry and consternation that I could have ever predicted. Stephen is a professional and his expertise carried the day. CD: How long did it take from inspiration to manufacture? Jones: From the day that Nathan and Jenny challenged me to “come up with something better” to the day that I delivered my first Attic Ease kits (Brass and Satin/Nickel) to Elliott’s Hardware store in Plano, Texas almost a year to the day had lapsed. One year and thousands of dollars with many private hesitations and doubts later Attic Ease™ had been born. The journey was just starting. Marketing had to be done. Assembly (initially being done in my proverbial garage) was being done. Buyers from Berings in Houston, Breed & Co. in Austin, Stine Home Improvement Centers in Louisiana, Pierce Hardware and Knob Hill here in Dallas and wholesalers such as Do It Best in Fort Wayne, Indiana (4,100 stores) all bought into the idea of Attic Ease™ kits. To make a long story short, we are now very excited to announce that Home Depot, Lowes, and Menards (the three largest home improvement center chains in the U.S.) have all committed to selling Attic Ease™ kits. We are getting inquiries from Australia, the U.K. and elsewhere. It’s all hard to believe, but it is real. Jones: Attic Ease kits will not solve world problems nor stop the rise of the oceans. But the kits provide a solution to that ubiquitous problem of “ugly dangling attic cords.” Attic Ease™ provides a simple, efficient and fashionable system for accessing and staging recessed residential attic stairways that exist in practically every home in the world (and builders are still putting the darn things in hundreds of thousands of homes every year). Attic Ease™ turns an existing eyesore into an attractive feature that every homeowner/renter will be and is proud to have within their homes.